The Publix Georgia Marathon is just one month away and it is time to give away a race entry to someone that is ready and able to run either the 13.1 or 26.2 distance. If you are in training and can be ready to run one of these distances in a months time continue to read as there is a very good chance that you will have an opportunity to run the 2013 Publix Georgia Marathon for free! As I mentioned in my last post, I once again this year will not be able to run. I have been running off and on, but continue to revisit the injury that has been haunting me for nearly two years now. I am a stubborn runner, but I have finally, yes finally, made a physical therapy appointment for tomorrow. I am ready to get this calf fixed for good so next year I can be talking about my training here on the blog. This years race will take place on Saint Patrick's Day, March 17th, 2013 at 7:00 a.m. 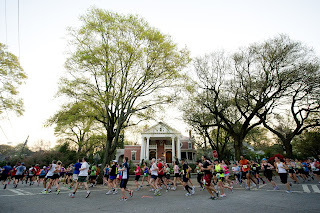 The race course will travel through metro Atlanta’s most interesting and historic areas and along the way runners will pass many well known landmarks. 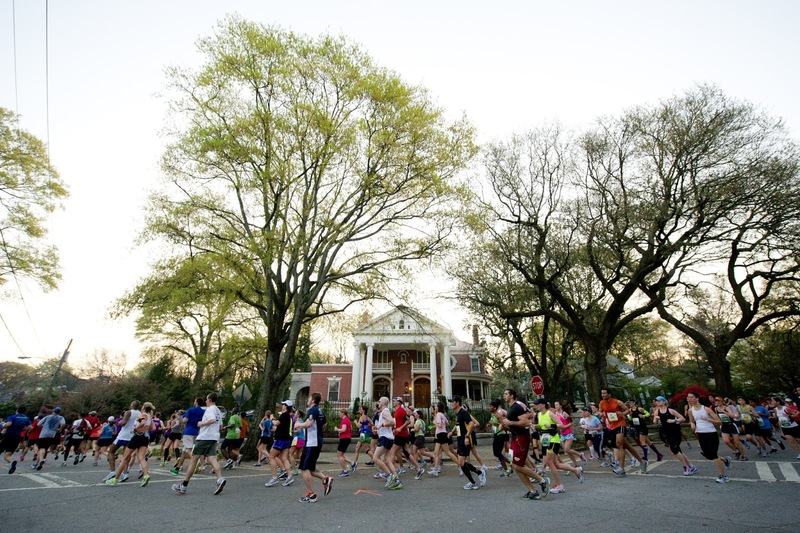 The Luckie 5K will also be run on the 17th at 7:30 so all races will be run on the same day. To register you can head over to www.georgiamarathon.com or straight to the Publix Georgia Marathon Registration Page and while you are there you can get $10 off of either the full or half marathon by using the code: BLOG10OFF13. Thanks to the US Road Sports team, one of you will have the opportunity to run either the full marathon or half marathon on Sunday March 17th free. Join the Georgia Marathon Fanpage, follow them on Twitter at @GeorgiaMarathon and leave a comment for each of these as well. I would love to win a free entry for this year's GA marathon and keep my GA marathon streak going! I am definitely trained and it would be great if I can make my 21st marathon a freebie! I forgot to answer about my training: I guess my training is going okay--been better but doing what I can. I kinda strive to stay in run a marathon shape all year round but definitely, sometimes injury keeps me out of the game. I hope you heal up soon, injury clinks stinks! I was there all of last June and it was a hard road back. I ran Marine Corp Marathon in October and had a less than favorable race that included a 10 minute porta potty stop 17 miles in. I'd love to get another chance at breaking 3:30. I'm training for an Ironman, so the running base is there. I hope I win! Training for a half iron in May - just finished Disney last month so hoping some fitness is there :) Working on keeping it in zone 2 right now to build a base. Hope I win - I love the Publix Marathon! I havent signed up yet but am planning on running since I am ga marathon streaker. Would be nice to get a freebie . These races get pricey.I hope I win. I am running the thrill in the hills marathon this weekend. And from the weather forecasts it sounds like might be a mud bath. Already thinking how much easier publix Marathon will be and trust me, I know it is not any easy course! Maybe Sat after the marathon, after I finish washing all the mud off me, I'll have energy left and update my poor neglected blog. I liked, I tweeted and googled plused again just now. I feel like spam. Shared again on my fb page. My current training is not Marathon ready as I am trying to get ready for first Tri. However, if I win, I can ramp my current 25+ weekly milage into a marathon finish in time. It would not be a PR, but certainly fun. And I really need a rosd marathon after that mudfest marathon today. Epic to say the least. But I finished, survived, and so now Ga publix marathon will be black jack marathon # 21!!! You know you love running when you are driving home after a marathon and see another runner out getting a run in and you're jealous because you are not running. Cant wait to wake up and go run tomorrow! Had a great 6 mile recovery run this morning. Hair of the marathon run done! Lovely 9 miles on the dry and solid sidewalk. Ready for my next mara thon adventure! I love running! And being a runner!